The Canadian National Railway (CN Rail) is one of two Canadian-owned lines in Michigan. CN enters the lower peninsula of Michigan from the east (Port Huron), the south (Toledo) and from Indiana (South Bend). It's main line runs between Port Huron and South Bend, via Flint, Durand, Lansing and Battle Creek. Three other lines run from Toledo to Detroit, Detroit to Port Huron and Detroit to Durand. In the Upper Peninsula, CN's main line runs from Sault Ste. Marie southwest through Trout Lake, Gladstone, and Menominee. Branch lines run north from Escanaba to the iron range west of Marquette, from Powers to Iron Mountain, and from Trout Lake to Munising via Newberry. 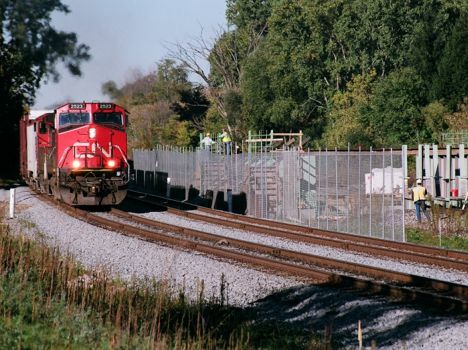 CN has yards in the lower peninsula in Toledo (Lang), Ferndale (Nolin), Detroit (East Yard), Pontiac, Durand, Port Huron, Flint, Lansing and Battle Creek. CN uses trackage rights on the Conrail Shared Assets between Vinewood and River Rouge though it does not own the line. In the upper peninsula, CN has yards at Gladstone and Ishpeming. CN also owns the international railroad tunnel at Port Huron..